Add a zing touch to your Indian wedding outfits by wearing chic & stylish salwaars for the wedding! How do you define an unconventional bride? Surely someone who doesn’t have to stick to the conventional ghagras, lehengas or a saree for her wedding, right?! But, if she wants to pick one of the chicest Indian wedding outfits, as a friend you need to help her choose the right one. But After all, she should be looking like a doting princess on her D-Day. Today, we would like to show you 20 salwaars styles that she could wear at a wedding and add to your trendy collection of Indian wedding outfits. Read on! 1. Jacket styled lehenga salwaar kameezes: A very special touch for the Indian bride, jacket styled lehenga salwaar kameezes with floor length anarkalis are quite the princess’s touch to the bridal ensemble collection. Layered hem prints, vintage patterns, lace and net fabrics used, bring about an elegant and a very grand look for the bride. With plenty of glitter and sparkles on some of the salwaars, one could balance the look with matte powdery hues on jackets and other parts of the apparel with the body of the ensemble being bathed in glittery notions. Popular styles are the lehenga with salwaar suit styles, salwaar with jackets, floor length anarkali salwaars with capes; embellished with kundan, stones, zardozi and zari. 2. The elegant anarkali salwaar kameez: Very versatile and chic, the elegant anarkali salwaar kameez can be worn for the varied rituals and the fun moments of the big fat Indian wedding. Available in a myriad range of patterns and designs, celebrities across tinsel town to the fashionistas of the world; everyone seems to have a piece each to wear and flaunt. The flare and the length of the suits depend from one to the next; everyone has an individual taste and choice, in accord to the lovely body types they have been bestowed with. From exaggerated flares to ankle-length anarkalis, fabrics in net, sheer and lace to cotton and silk, the elegant wedding anarkali salwaar kameezes are hot picks this season. 3. Pakistani wedding salwaar kameezes: Gaining immense popularity across the sub-continent, the super-luxe Pakistani suits much on the lines of the elegant anarkali is an eye-catching ensemble to wear on D-Day. The ensemble gracefully creates an illusion of length on the body and sits pretty on the knee, falling towards the ankle. 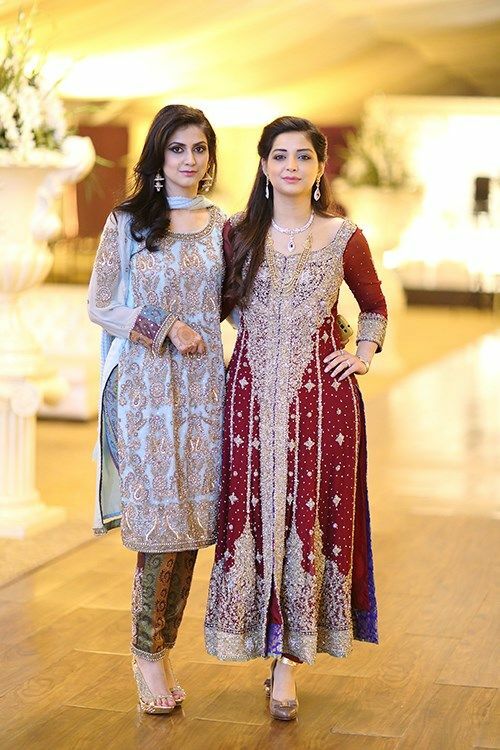 There are no flares as such with the Pakistani wedding salwaar kameezes; a straight cut pattern with a slit on either side is what you would have. However, the slits have embellishments and adornments in pretty hues, patterns, colors and motifs to flaunt. Fabrics on the slits comprise net, lace, sheer, with traditional to modern embroidered embossments. 4. Straight-cut salwaar suits: For most of the wedding rituals, brides opt for wedding salwaar kameezes that aren’t too fussy. Remember, flares and too much work on them for haldi and sangeets where movement is a plenty, isn’t advisable to wear. Sober straight cut yet very elegant and chic salwaar wedding suits are a trend. From deep V necks to round necks, backless to halter necks and Chinese collared ones too, the straight cut wedding salwaar kameez brings about a very formal yet fun look in vibrant to matte tones at the wedding. Fabrics used mostly are cottons, chiffons, net, lace and sheer; silks and rayon too. Popular colors range from creamy pastels to off-whites, wines to magentas, emerald greens to orange and blues as well. 5. The reigning Patiala Salwaar Kameez: The Patiala style salwaar with short kameez has been the staple for many Punjabi weddings for a very long time. Slowly gaining entry and momentum as a must-have bridal ensemble, it is the comfort and the aesthetic factors of this particular style of wedding salwaar kameezes that have captured the fancy of many brides-to-be. With plenty of movement expected while the rituals are on at a wedding, the Patiala styled wedding salwaar allows room and space around the leg area. 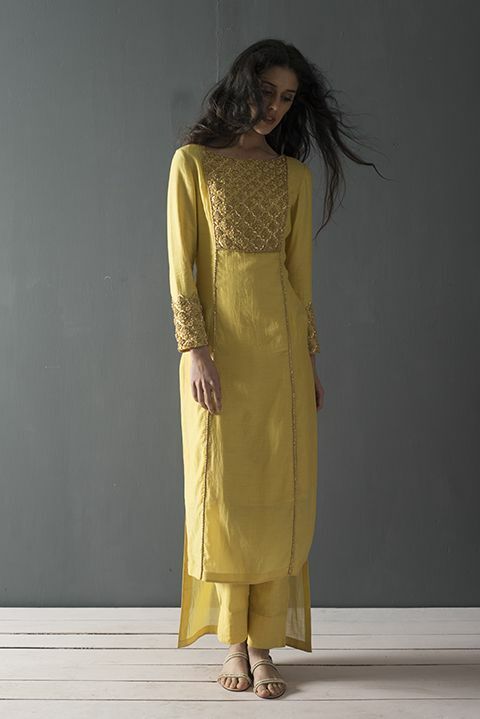 The short kameez embossed with chic traditional embroidery and chunky touches are a hit for summer weddings. Fabrics used mostly are cottons, chiffons, net, lace and sheer; colors chosen are bright and vibrant, bringing about an extra glow to the coy bride at her wedding. There are many more on the Indian wedding outfits when it comes to beautiful wedding salwaars for the Indian bride to choose from. Do let us know which of these Indian wedding outfits caught your fancy though!